A free standing towel rail is the perfect solution for not only drying your towels and clothes, but also allowing you to heat those cold spots in your house that your central heating just can't reach. With the added convenience of portability, a free standing rail has endless uses from drying your wet suit at the front door after a surf, to heating your children's clothes in their bedroom and keeping your towels toasty in your own bedroom. Our freestanding towel rail is guaranteed to provide cosy, radiated warmth for both you and the general area. A curved rail is the ultimate in bathroom statements: an excellent replacement to a bog-standard radiator. The beautiful stainless steel rail of our Inflecto range never fails to impress aesthetically. The curve allows space for your luxuriously thick towels and the range can be used both electronically and as part of the central heating with our clever dual fuel technology, allowing you to use the item all year round. Its water circulation provides optimal warmth, whenever you need it. Our Prolixus range is another great option for a heated towel rail, fitting onto the wall with extra width and enhanced power. Thick and durable, yet elegant and stylish, a Prolixus heated towel rail fits the look of your bathroom, whilst amplifying its style. All of our varieties of heated, stainless steel towel rails can be fitted with our thermostatic valve for power and heat efficiency, providing the best in warmth in an environmentally conscious fashion. 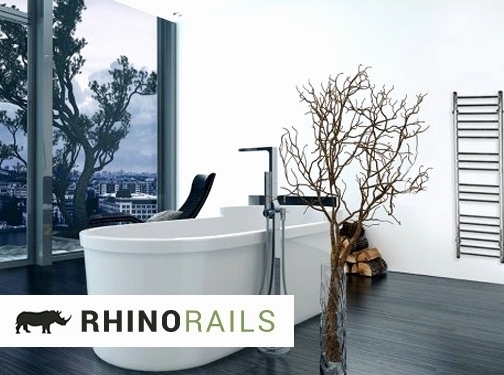 If you think one of Rhinorails" products is right for your bathroom, bedroom or anywhere you"d like, get in touch today and allow us to talk you through the best options. UK (Barnstaple, North Devon) based business providing heated towel rails. Website includes e-commerce facilities, delivery and returns information, testimonials, terms and conditions, news section, FAQs, full contact details including company registration and VAT numbers.